It's been a while since Nokia as a brand ceased to be a market leader in mobile telephony. The Finnish giant abandoned the smartphone market after the failure which represented the Lumia with Windows Phone. However, the manufacturer intends to return again to make of smartphones, after the acquisition of manufacturing rights by the famous company Foxconn. But this time it will return to the market with Android phones, and not with the Microsoft operating system, which is inching closer to failure among consumers. Nokia D1C is the exciting new smartphone by the Finnish manufacturer, which has just been seen in a note within the reference platform GeekBench. We do not have many details derived from this platform, but still we have important information that helps us understand what kind of range this device belong. According to the characteristics shown in this platform, will have an octa-core Qualcomm Snapdragon 430 processor with 3 GB of RAM, something away from best smartphones from other companies. The score obtained by phone at GeekBench benchmark is 667 points in a single core and 3229 points in multi-core performance. From these characteristics, we can see that the Nokia D1C is a low price smartphone with good quality for the price at which it is sold: yes, there will be a device from the top of the market, as everyone expected. The latest leaked information obtained through GeekBench is the fact that this terminal will come with the Android 7.0 Nougat operating system. Obviously, the results only show the speed of data processing, but provide no information on the quality of other important components such as the display. Beyond this Nokia D1C, plans to manufacture two high-end Android smartphones later this year still stand, probably with a high quality design and construction of metal, large screens and fingerprint scanner, and a camera especially innovative. The website Gizmodo China claims that these two phones are supported with Snapdragon 820. 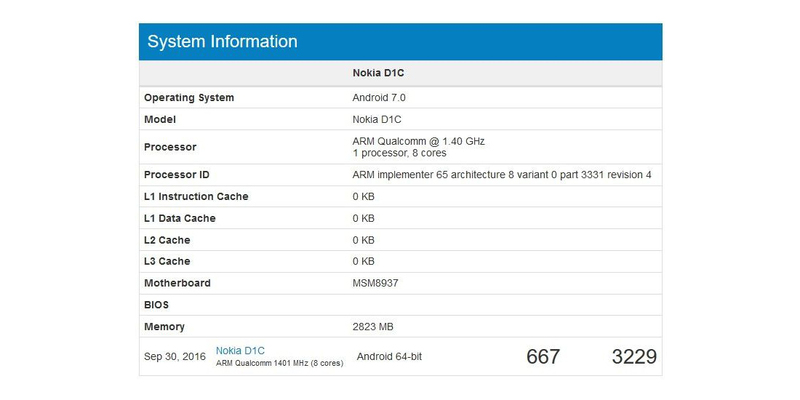 Potentially, it could be the Nokia 5320, which had been in GeekBench late last month. In short, we do not expect a return of impressive Nokia in this field, and less after the experiment that led to the tablet Nokia N1, which had no success. Nokia will have to do something really special to not repeat its mistakes. It can not rely only on the nostalgic factor, because the current user may be radically different from the past.